I started to try and build a cheap radiation detector one which would respond to background radiation. 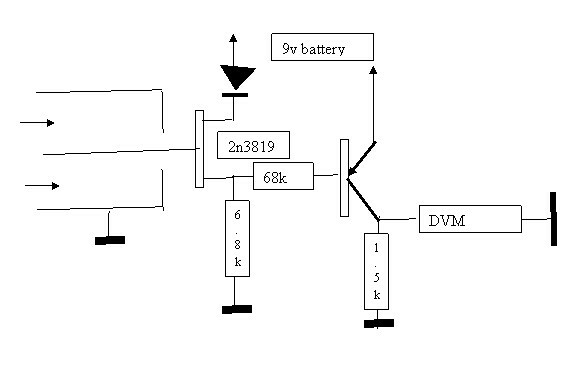 My initial experiments were with a simple circuit with 2 transistors and a cheap Chinese DVM display. The circuit is based on the idea that a 2n3819 FET will turn on if its gate is left floating, something to do with drain gate leakage. In this condition there is max sensitivity to electric fields. The 68k turns on the PNP transistor when the FET turns off due to radiation. This resistor will be changed to suit the transistors gain. The DVM was originally an ammeter from China with a sensitivity of 40mV full scale. These were ordered because the large shunt is easily recognisable and can be removed. This was replaced with a voltage divider giving 40mV output for 4v input. The whole lot with a 9v battery fits rather neatly into Maplin box G093. the lid being cut out to allow free passage of alpha particles to ionize the air inside. As regards background radiation it was a miserable failure unless your neighbour is generating his own power. It does however detect Brazil nuts, mantles and smoke detector americium if placed close enough. It was noted that very few isotopes are good gamma emitters most are alpha or beta. To detect these particles you need to be close to the source as they are attenuated by air.